On Monday February 6, 2012, I took a walk down memory lane to McNear’s Mystic Theatre in Petaluma, CA to see The Jayhawks, a legendary alt-country-rock band from Minneapolis, MN. The opener, Abigail Washburn was accompanied by Kai Welch. The duo played a heartful set of her folk songs, mixing harmonic vocals with guitar and banjo. At one point in the set, Abigail and Kai sang a song completely a capella, without using any instruments or even microphones. Sounded great. The Mystic is shaped like a classic movie theatre, with good acoustic treatments on the walls, providing a perfect canvas for the warm, analog PA. The house sound system includes a Soundcraft MH3 console, driving a well designed Apogee loudspeaker rig. Analog audio geeks and sound engineers, you can see the full technical details of the Mystic Theatre’s FOH and monitor systems here. The Jayhawks have taken on a few different forms since they started playing as a band in 1985. After being on hiatus from 2005 to 2009, the band reunited to their Tomorrow The Green Grass lineup of Gary Louris, Mark Olson, Marc Perlman, Tim O’Reagan, and Karen Grotberg. Their latest album, Mockingbird Time, was released in 2011, twenty-five years after their first recording. They opened their set at McNear’s with the classic Wichita from the Hollywood Town Hall album, followed by a song off Mockingbird Time called Cinnamon Love. The new album songs went over well with the polite crowd, who seemed happy to support the band’s “new direction”. I counted 17 songs before the encore break, about two-thirds would be what I would call “old stuff” (Two Angels, Pray For Me, Take Me With You When You Go) and about one-third “new stuff” (Black-Eyed Susan, Mockingbird Time). It was nice to hear them play Clifton Bridge from Mark Olson’s solo album, The Salvation Blues, released in 2007. They closed the set with A Break In The Clouds off of the album Smile, and the traditional gospel song Up Above My Head, inviting Abigail and Kai to join them back on the stage. After much applause, The Jayhawks returned to the stage to play four more songs, including of my favorites from Rainy Day Music, Tampa To Tulsa. The drummer, Tim O’Reagan, wrote the song and also sings lead on it. His voice is so soothing, I wish he sang lead on a few more Jayhawks tunes (and I know I’m not the only one!) I guess in that way, Tampa to Tulsa is kind of like The Jayhawk’s version of Beth, the ballad sang by Kiss drummer, Peter Criss. Hearing it performed live always sounds special and unique, leaving the crowd wanting more. 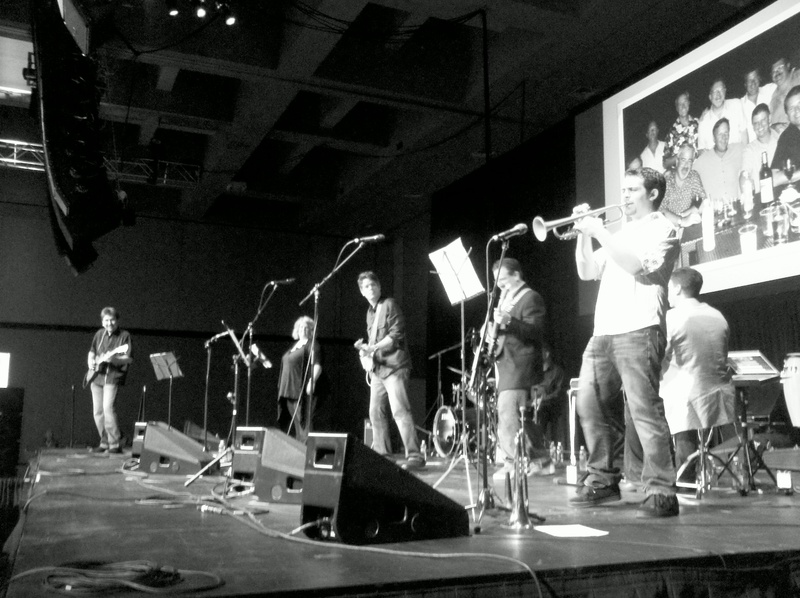 Left to right above: Gary Louris, Mark Olson, Marc Perlman, Tim O’Reagan, and Karen Grotberg of The Jayhawks 2/6/2012. On June 14, I attended the Infocomm 2011 opening keynote and reception at the Orange County Convention Center in Orlando, Florida. The reception was followed immediately by An Evening To Remember Kevin M. Collins. As VP of HB Communications and former Infocomm executive, Kevin was an audiovisual industry icon before he departed this life earlier this year. His friends and coworkers recently started a scholarship fund for his youngest daughter, Caroline Collins, and attendees were encouraged to contribute. Joyful laughs mixed with tears as the stories of Kevin were passed arround the room, filled with many of his former coworkers, manufacturers’ representatives, industry friends, and family. Seven of Kevin’s friends from HB Communications (from two offices) got together to form The HB Communicators, and learned a mix of upbeat songs for the memorial event. The band consisted of CEO Dana Barron on drums, Jody Thompson on lead vocals, Bert Coburn on bass, Ian Stewart on trumpet, Ted Thompson on guitar and lead vocals, Eddie Nowik on lead guitar, and Michael Joseph Yorgensen on keyboards. They played almost two hours, as a slide show of memories served as their backdrop. It was a wonderful event for all present. If you were unable to attend, and still want to contribute to the scholarship fund, you can fill out this form or email info@hbcommunications.com for more information.